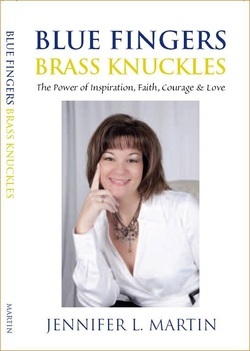 Blue Fingers Brass Knuckles is my auto-biography fighting and battling my way through Multiple Sclerosis, Thyroid Cancer, Weight Loss Surgery, Severe Anemia with Law of Attraction, positive thinking, lots of prayers and lots and lots of laughter. Laughter is the best medicine and is what helped me through a lot of trying times. It's a great self-help educational book for newly diagnosed, the patient, their care-givers, loved ones, friends and family. Without the Power of Inspiration, Faith, Courage & :ove, this book would not exist. My mission in life has, is, and always will be to help people in any way I possibly can, one person at a time. "Take the time to line up the Energy first, and action becomes inconsequential. If you don't take the time to line up the Energy, if you don't find the feeling place of what you're looking for, not enough action in the world will make any difference."